No different than anything other summer, Coach Tucker’s team would go on a run each morning, but in 2008’s first run of the summer something different did happen. “It’s funny how he’d never thought about runner until I jokingly asked him to come along,” Tucker recalled. 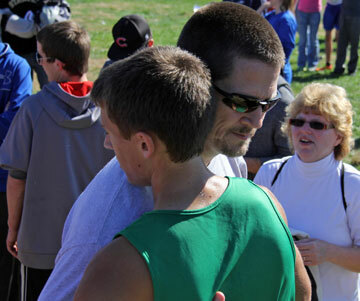 Almost immediately after every race there is one person you will find Seth Schenck talking to or in Saturday's case giving his dad a hug. From that point on Tucker continually worked with Schenck all through middles school, having him run with the high school team at times, “just because he could handle the workouts,” Tucker said. He was born to be a runner. 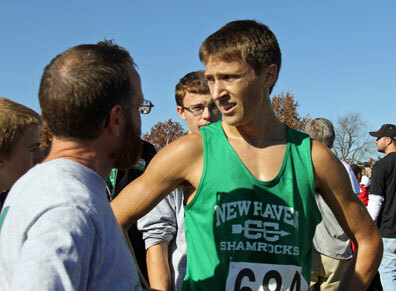 Pictured with Seth Schenck is Coach John Tucker, who in a way sparked, what became greatest cross country career at New Haven High School. 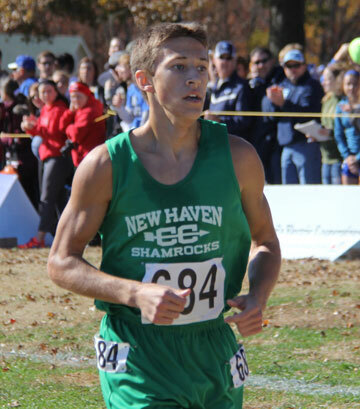 Among his countless medals won during the regular season in his four years of running, Schenck finished in the top three each year at conference, (2010 - 2nd, 2011 - 2nd, 2012 - 3rd, & 2013 - 1st) and took fourth place each of his first three years at districts before winning this past year. Schenck moves right into basketball season before he completely ends his running career later this spring in track.